The date and location for the Presbyterian Church (U.S.A.)’s sixth Big Tent is Aug. 1-3 in downtown Baltimore. The theme – based on Romans 12:2, chosen by the PCUSA Stated Clerk the Rev. Dr. J. Herbert Nelson III – is “Called to a Movement beyond Institution,” which will emphasize the hope of the Gospel and its power to challenge institutional conventions. The goal is to come together and live in this moment, immersed in our current cultural context of racial division, gender inequality and economic disparity to be renewed, refreshed and reformed, so that that we can be sent out to affect change in our own communities. Big Tent will provide a place where Presbyterian polity and identity is the foothold by which we proclaim the Gospel of Jesus Christ in action and answer the call to discern the will of God together. Based at two downtown hotels, the Radisson and Lord Baltimore, the event will be accessible and affordable – making it possible for more Presbyterians to come together for a time of learning, engaging and fellowship. 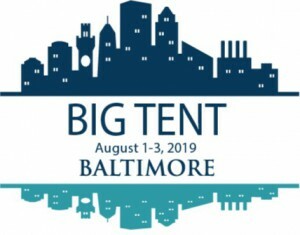 Since its inception in 2009, Big Tent has been a “Big Presbyterian family reunion.” It is the assembly between General Assemblies that brings Presbyterians together to celebrate the church as the Body of Christ and engage in deeper conversations about how we can be the community we are called to be in this age; to live out the Gospel of Jesus Christ as children of God whoever we are, wherever we are. Planning teams are busy selecting worship leaders, plenary speakers and creating opportunities for engagement within the Baltimore community. The hope is that through worship, Bible study, learning opportunities and active engagement with one another and the community, attendees will encounter the Church participating in God’s mission for the transformation of creation and humanity. Registration details and more information is available here.